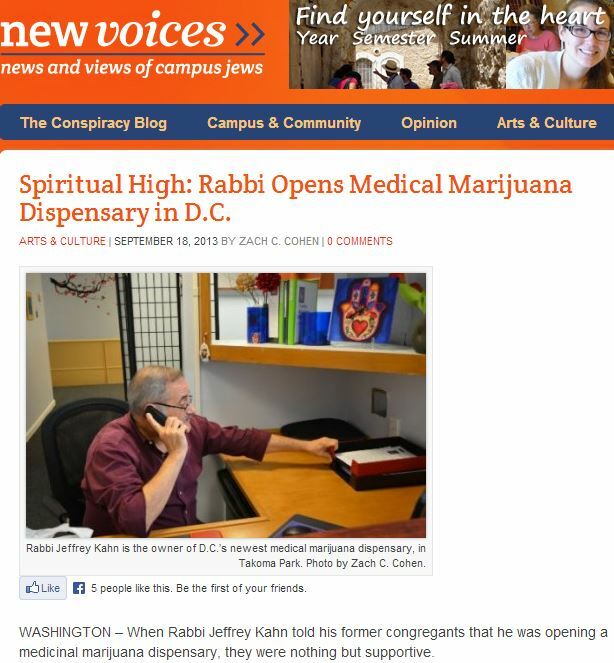 WASHINGTON – When Rabbi Jeffrey Kahn told his former congregants that he was opening a medicinal marijuana dispensary, they were nothing but supportive. “The cannabis plant was created by God on the second day of creation when God created all the other plants, and touching this one isn’t forbidden,” Jeff said in a June interview. This was a really fun article to write. Jeff and Stephanie were absolutely phenomenal, and they’ve really got a great story to tell. I wouldn’t have put in the time and effort into this piece that I did if I didn’t believe that. I interviewed them in June but didn’t get a chance to hand it into the editor before I went to Costa Rica. There was a transition between New Voices editors (welcome, Derek Kwait! My old boss, David A.M. Wilensky, is off to bigger and better things at the Jewish Outreach Institute), so I ended up publishing the piece here, and it was one of the more popular posts I’ve ever published on this website. I’m glad I now get to share it with the New Voices audience, whom I haven’t written for in well over a year. If you’d also like to publish this story, please contact me. “The cannabis plant was created by God on the second day of creation when God created all the other plants, and touching this one isn’t forbidden,” Kahn said in a June interview with New Voices, a national magazine for Jewish college students. @Zachary_Cohen @New_Voices_Mag @TakomaWellness @ABC Thanks for the lead, Zach! 67 days I’ve been in my new home of Costa Rica. 67 days until I go back home the U-S-of-A. I have a lot of mixed feelings about that revelation, some of them clichés but all genuine. I’d also like to name this the theme song for last week, as it was also the High Holy Day week, the most sacred week of the year for Jews. Ladies and gentlemen, Bon Jovi. I was in 4th grade on Sept. 11, 2001. While most of the world knew what had happened in New York, D.C. and Pennsylvania, I was in the dark until about 3 p.m. The only hint I got that something was off: We held recess indoors on that beautiful sunny day. I met both Mom and Dad at home right after school. I remember thinking how strange that was, since my father was never home that early. They told me everything as we huddled around the kitchen counter. About the planes. About the towers. That my aunt living in New York City was safe but that friends of friends who worked in Manhattan were not. I went to class the next day and heard the harrowing tale of how my 4th grade teacher went through the whole day without mentioning the attacks, instead continuing to teach as if the world were not crashing down around us and as she shook from head to toe. Live coverage of the attacks played in the teacher lounge but far from the eyes and ears of impressionable elementary school students. Senior school administration decided it best to let parents explain this day to their children. I went to Hebrew School and sat in a special session with all of the grades together.I asked a question about “the World Trade Center and the Twin Towers,” and they quickly corrected me, saying they were one in the same. I clearly did not know what was going on. I didn’t know what a Pentagon was. I didn’t know who attacked the U.S., or why they did it. And I certainly didn’t realize just how much it would affect me, and the world I live in, for the rest of my life. 12 years later, I have a much better understanding. I’m not sure if I was clueless then because I could connect the dots (I wasn’t the sharpest kid back then) or because I couldn’t grasp the magnitude around what happened. 12 years later, I still don’t know how it has affected me. But I do know that almost 12 years later that I’ve been affected. 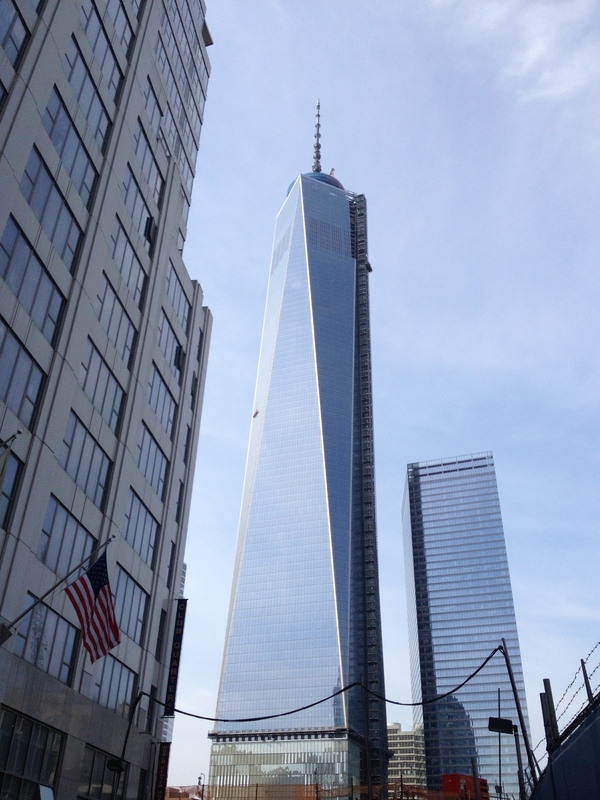 I know I felt pride and awe when I saw One World Trade Center rising into the sky. I know I felt chills when I saw the name of Dana Ray Hannon, a firefighter with Engine 26 from my hometown of Wyckoff, N.J., just across the river from Manhattan. His name has been etched into the stone for the ultimate sacrifice he made that day. I still remember singing with that same 4th grade class at the unveiling of his memorial at Wyckoff’s fire department headquarters. I know I felt empty saw the gaping hole where a tower used to be, the footprint massive, deep and eerily silent with the exception of a thunderous waterfall. The World Trade Center memorial in June 2013. Photo by Zach C. Cohen. 12 years later, I’m still afraid. Not of terrorists. And certainly not of Arabs and Muslims. As a journalist, I do not hold many biases or opinions so I can look at political issues with a clear head and a keen eye. But I have no problem publicly standing by the First Amendment and basic human decency. As a journalist, it is my duty to defend freedom of speech. As a Jew, it is my duty to defend against bigotry. As an American, it’s my duty to defend both. I’m still afraid because, like I wrote in 2010 for AmWord and again for the Suburban News, Islamophobia is still rampant in the United States, and Arabs and Muslims are still targeted unfairly for sharing a heritage with the 19 men who attacked the United States 12 years ago. Just earlier today, Pastor Terry Jones was arrested with thousands of kerosene-soaked Qurans. I am disgusted at every revelation from Edward Snowden, Glenn Greenwald, and the Guardian about the massive violation of essential rights committed by the NSA. I worry greatly about the chill this puts on speech, on assembly, and on the advancement of technology. I don’t blame the spies. Cats must kill, spies must spy. I blame our leaders for not doing their single most important job: protecting freedom. …Now that the 9/11 Memorial is complete, every activity of the day is being held there, closed behind wire and walls. I could barely hear the bagpipes in the air. That the 9/11 Memorial and today’s remembrances are held in a fortress is emblematic of the wrong path we have taken these 12 years: not toward openness but toward isolation, not toward generosity but toward defense, not toward principles but toward expediency. We should be closer to freedom. We are farther away. I’m afraid because we have not learned the right lessons from 9/11. We have not learned tolerance and peace. All day has felt like a blur to me. In Costa Rica, 9/11 is not exactly on the national psyche, which in and of itself was a surreal experience. My only connection to 9/11 today was the flood of comfort on Facebook from friends to those who lost loved ones on 9/11, as well as an incredibly moving story of grief and confusion. But with an event as gigantic as 9/11, both in scope and import, it makes me wonder if condolences are sufficient. I announced on this blog last week that I was going on a tech detox. 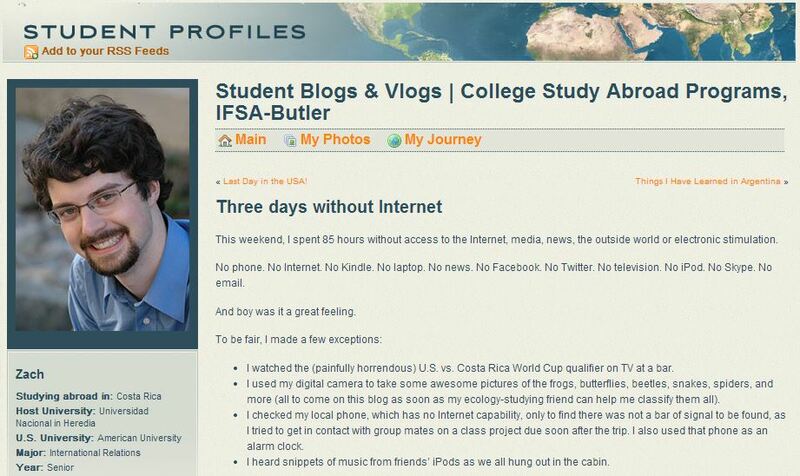 This weekend, I spent 85 hours without access to the Internet, media, news, the outside world or electronic stimulation. No phone. No Internet. No Kindle. No laptop. No news. No Facebook. No Twitter. No television. No iPod. No Skype. No email. And boy was it a great feeling. Maybe you’ve always had an idea for a book but were too daunted by the traditional gatekeepers of agents and publishers. Well now you can dust off the manuscript and get read to publish, because the growth of self-publishing services and social media makes it easier than ever to self-publish your book. But whether you self-publish or have a traditional book publisher, you’ll need to do more marketing, more outreach, more organizing — more of everything! Authors are really becoming entrepreneurs, needing to understand the business of book publishing more than ever (even if they never thought they’d need to know this). This week’s Mediatwits talks to successful self-published authors as part of our “Authors as Entrepreneurs” special, including self-published author, expert and MediaShift contributor Carla King and successful self-published authors Darcie Chan and Hugh Howey. MediaShift’s Mark Glaser hosts, along with Mónica Guzmán from the Seattle Times and GeekWire and Andrew Lihfrom American University. See all of the latest PBS Mediashift research on this topic, as well as bios of the panelists. This was my last podcast I helped produce for MediaShift before I left Sept. 4. Hello, my name is Zach, and I’m a technoholic. I’m always connected. To my phone. To email. To Facebook. To Twitter. To digital conversations far and wide, public and private (who am I kidding, it’s all public). It’s gotten to the point that I can’t go an hour and a half without itching to turn my phone, tap in the code and scroll through every information feed I can get my hands on. In the States, where Internet is ubiquitous, my phone battery is dead by 2:30 p.m. Here in Costa Rica, Wi-Fi is still ubiquitous enough that I’m connected most of the day. As someone who lives online, I need to learn how to disconnect, for my personal sanity and for the sake of truly enjoying life without pixels. I need to take a break. I need to detox. I need to quit cold turkey. Starting tomorrow. As of Thursday morning through Sunday afternoon, as I go hiking through Parque Amistad in the most eastern part of Costa Rica, I will be completely offline. No iPhone. No computer. No Kindle. No Facebook. No Twitter. No Skype. No email. No iPod. This is everything work and technology related I am bringing on my trip to Parque Amistad this weekend: a notebook, a camera and a phone I don’t plan to use. Just my friends, a big binder of school reading, a notepad to jot down some thoughts, and lots of physical activity, like hiking, farming, building, etc. A trip to a country without my data plan has been a struggle in and of itself. I’m constantly looking for Wi-Fi signal and occasionally missing out on the country I should be exploring. I haven’t had the opportunity to fully unplug. This will hopefully be the opportunity I need to, so to speak, rip the band-aid off. Having just left MediaShift today, tomorrow will be the first time in more than three years (over 1100 days) that I will not be replying constantly to emails from editors and sources. Mid-terms are coming up, but my preparation can take place entirely offline with the use of a very large notebook. 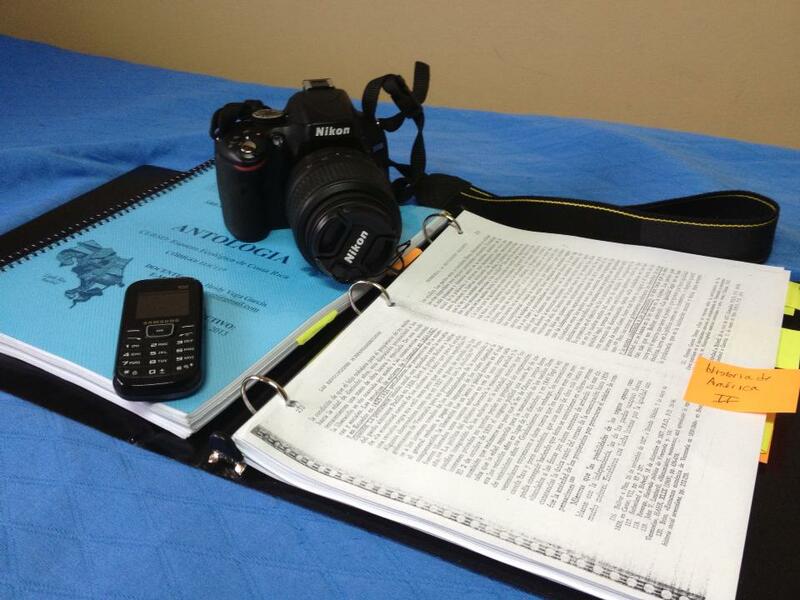 Any paper writing and presentation creation can and should take place after reading all the material anyway. If anything, staying disconnected will let me get work done faster. Rosh Hashanah (the Jewish New Year) begins tonight and ends Thursday night. Shabbat begins only 24 hours after that on Friday night and ends Saturday night. Both are holidays that should be reserved for contemplation and relaxation. For the first time in a long time, I’ll be able to do just that. It’s been years since the last time I’ve gone without Internet access for more than 24 hours, especially with my 3-year-old dependence on iPhone, which I only half-jokingly refer to as my third arm and an extension of my body.